San Francisco Giants pitcher Matt Cain has pledged a $50,000 donation to the Make-A-Wish Foundation after seeing the success of the organization’s “Batkid” visit to San Francisco last month. 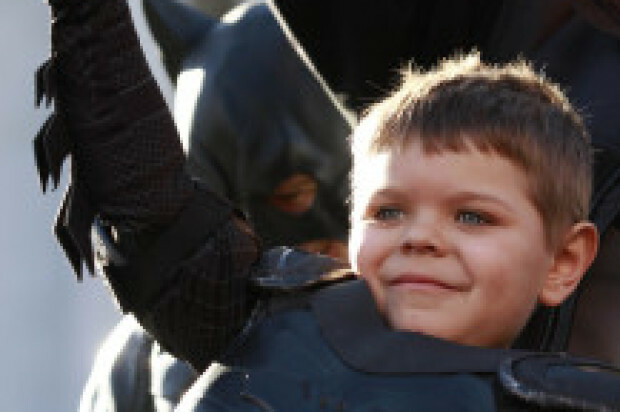 Make-A-Wish grants wishes for children with life-threatening illnesses, such as 5-year-old Miles Scott who became the San Francisco superhero, Batkid, on Nov. 15. 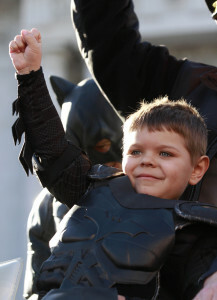 Miles, who is recovering from leukemia, went around the city in a Batman-like costume fighting villains at staged crime scenes, and had the attention of nearly all Bay Area residents, with even President Barack Obama commenting on his superhero talents. Cain took notice of the pint-sized hero from Tulelake, Calif., and wanted to support Make-A-Wish. The ballplayer and his wife, Chelsea, will give $50,000 to the organization once its Bay Area executive director Patricia Wilson raises the same amount. Wilson has raised more than $20,000 for her part in the annual “Brave the Bay” charity event for the organization held last Saturday at Aquatic Park in San Francisco. She took an icy plunge into the Bay during a cold snap, as did San Francisco police Chief Greg Suhr and other police officers and Make-A-Wish board of director members. Wilson has until 8 p.m. Wednesday to raise the remaining money to trigger Cain’s matching donation.